I still haven’t posted much brewing content to this blog, but rest assured I am planning to! In the meantime, I thought I would write a little about my first experience making wine. 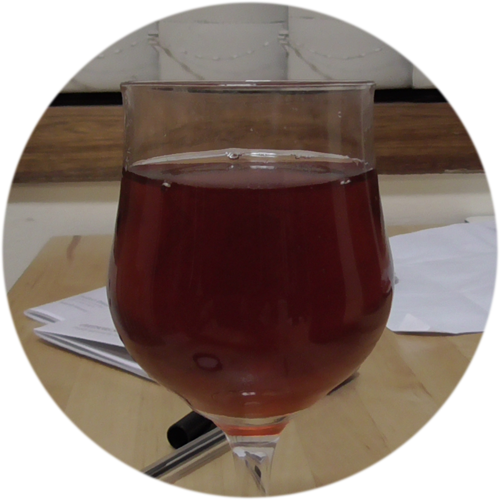 No, not grape wine (leave that to the pros … for now!) – but date and berry wine. Date wine has a venerable history as nearly all wines do, with recipes dating back at least two millennia. I ignored all of those recipes and followed my instincts. Given this was my first wine, I kind of expected it to be a catastrophe, so I wasn’t particularly fussy with ingredients or process. 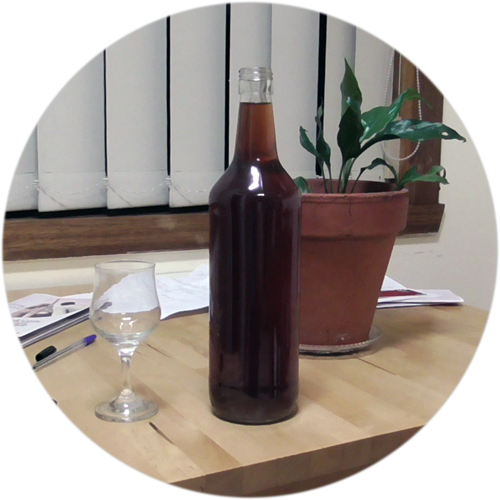 Surprisingly the finished product turned out to be delicious – and I have been assured by others who make date wine that these drinks really benefit from age, developing complex date flavours in one to three years. I have no idea what complex date flavours taste like but I suppose I will find out if I am patient. 1099 OG, 1011 FG. 12% ABV. I used dried dates from a local Chinese grocery store. First, I chopped each dried date in half, then added them to a saucepan. I poured in enough water to only just cover the dates, brought it to the boil and added the brown sugar. I boiled the mixture for thirty minutes, then took it off the boil to cool. I covered the pot and let it stand overnight until it hit room temperature. The next day I minced the mixed berries – bought frozen – in a food processor and put them in a large stock pot. I poured in the apple juice and then added the brown sugar and date syrup. Finally, I pitched a fruity dried ale yeast (M79) on top, covered the pot with glad wrap, put it in a corner and forgot about it for two months. Well – that’s not entirely true – I didn’t forget about it. I looked at it quite a lot to be honest, because it fermented for literally sixty days and I was constantly checking for it to finish. The yeast frothed up into viscous white bubbles, rippling and overturning the floating berries, which reduced in vitality day by day as the little funghi went about leaching out their sugars. This vigorous, long fermentation I can only attribute to having something to do with the solubility of the berries and dates and the ability of the yeast to access the residual sugars buried deep in their tissue. If I hadn’t boiled the dates beforehand fermentation could have potentially taken six months, or even a year, who knows! Unfortunately I did not take photos of the winemaking process itself, but I do have some of the finished product. As you can see it is a clear, robust red wine. I tasted a small glass fresh on bottling day. It poured a fine, still copper rum red and smelt tannic with high alcohols. When I tasted it, however, tannins were barely present. It is an extremely sweet wine, reminding me a little of fortified wines. There are hints of tartness from the berries in there, but no flavour I could identify from the dates. It goes down super smooth with a very soft mouthfeel and a dry, slightly acidic finish. I think this is a warming, winter’s drink – it would go well with cheeses (in place of quince paste). 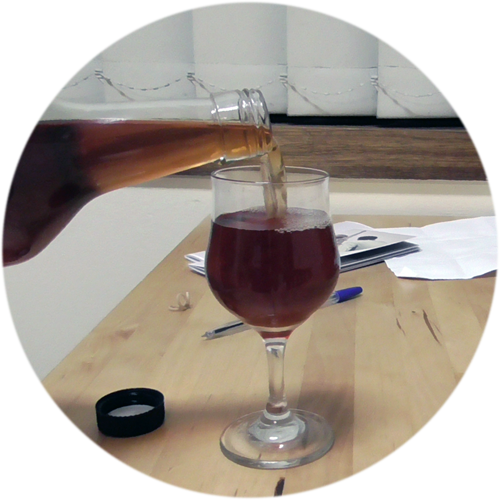 It carbed mildly in the glass when left for half an hour – pointing to residual sugars I will need to ferment out of the bottles. I said it earlier but I was extremely surprised and pleased with how this wine turned out. So soft! So smooth! So drinkable! I can’t wait for it to age – and I can’t wait to make more wine.